Our Physiotherapy Elective placements are within day-care centres for children and young adults with various learning and physical disabilities. You will work alongside qualified staff, using your creativity in an environment with fewer resources than you will be used to. Projects Abroad will work with you and your university to make sure your placement will meet the objectives of your elective module. Our in-country staff will help you through the pre-departure process and be on hand to help with any specific paperwork needed. When you are in Morocco, you will be allocated a supervisor who will be a qualified member of staff. They will discuss specific cases with you and answer your questions. They will be keen for you to have a fulfilling time at the placement. Physiotherapy students can work in a day-care centre for children aged from 3 – 12 years old. They have varying degrees of disabilities and special needs. The school carries out a lot of therapies and has its own small animal unit and gardens. The children thrive here and you will be able to help make a difference to the quality of their lives. 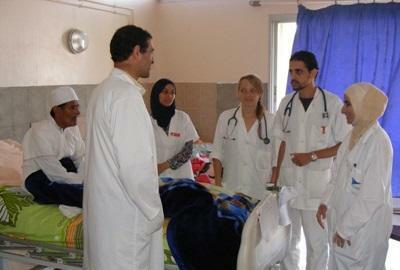 To take your Physiotherapy Elective in Morocco, you need to be able to speak a good level of French or Arabic. Please note, this project is not available from mid-June to mid-September. While you are in Morocco, you will live with one of our host families. Here you can experience the warm hospitality of the Moroccan people, while brushing up on your French or Arabic language speaking skills. You will also become part of our vibrant Projects Abroad volunteer community.